Glossier – Is it worth the hype? 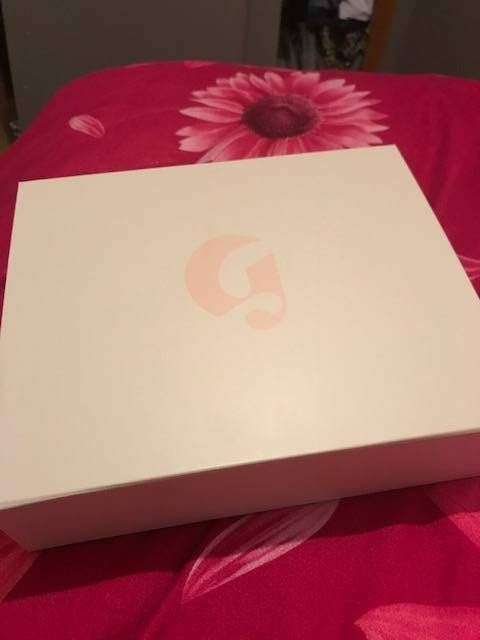 afshanesque November 30, 2017 Blog8 Comments on Glossier – Is it worth the hype? 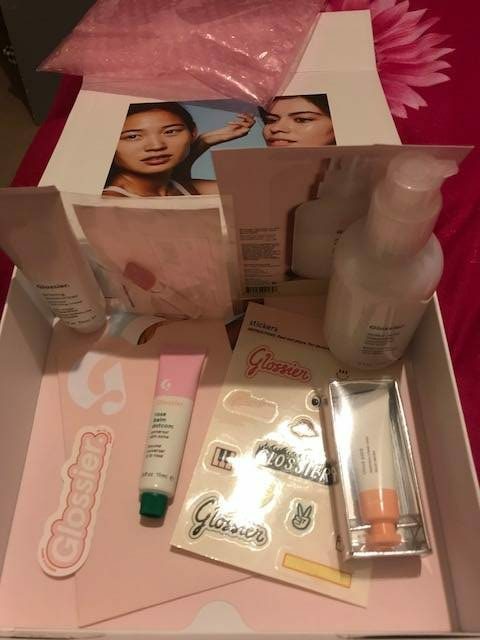 So you must know by now that Glossier launched in the UK and if not where have you been? Well, like me you may have heard so much about Glossier and that they are so good. They have a range of skin care, make up, body products and now have launched a new fragrance. So have you tried any of the range? I was intrigued too, so once I found out that there will be no shipping charges or even a custom charge (if you’re really unlucky), I decided to embark on with an order. I decided to try and start with their hero products and what better way than with a pack. The pack contained three products, the balm dotcom, the milky jelly cleanser and the priming moisturiser. I also got the Cloud Paint in Beam (liquid blush in an orange packaging, with peachy undertones). They come in some fantastic packaging. 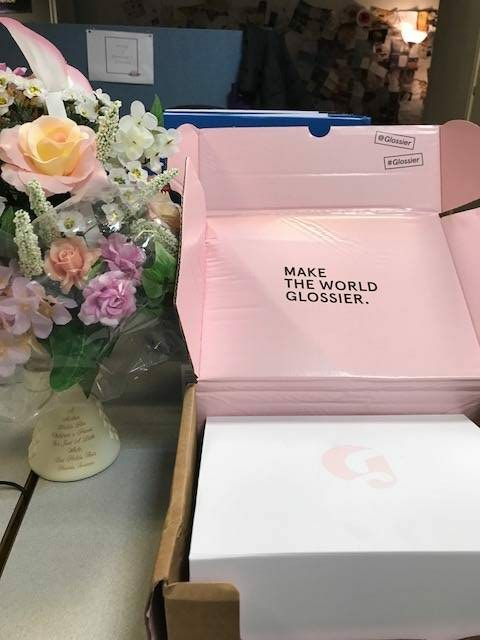 Double boxed in the usual brown packaging, one opened it revealed the emergence of a lovely box that when opened greeted me with the headline “Make The World Glossier”. Inside were not only the products, but they came in a pink bubble wrap bag, which I must say has impressed a lot of people. I don’t see what the fuss is about to be honest, but I think they will come in handy for storage. So my verdict – The lip balm isn’t the best, but I have found if I wear it at night, it is much better and more moisturising . I like the cleansing jelly and it smells amazing, as I don’t have bad skin, it is perfect for me and best to use daily and not drying at all. Just don’t be fooled into thinking that it will remove eye makeup, as it is more of a daily cleanser, but nevertheless a good one. I also like the moisturising primer, as it is thick and suitable to wear in the winter. I have also used it under my foundation. I love the cloud paint the best, the colour is really nice and you can dot it on the cheeks, as little and as much as you need/want. It can therefore be suitable for dry prone skin, as it is better than a powder blush. I loved the colour too and Beam looks great on Asian skin. So was there too much hype? Yes, but I at least got to try some good products, that I otherwise would never have known about, let alone have tried! Will you buy into the hype? I haven’t heard of them myself so wasn’t aware of any hype around them. I would love to try it myself though. Everyone has definitely been talking up this brand… I haven’t tried it yet. Thanks for such an honest review. I am a sucker for neat packaging actually so I would probably be in to that set up. Love this review, it feels totally honest – unlike many reviews I read, which then causes people to be disappointed due to the product being hyped up so much! I’ve never heard of this box before, but it’s always fun to try out new products! Nice to read your thoughts on these products. I’ve heard a few things about them, and most people are raving about it. The packaging annoys me, as I like minimal for environmental reasons. However, the products sound decent enough. Never heard of Glossier before but the products look nice. I think the Cloud Paint would be the one I’d try although it sounds a bit like Benefit’s High Beam. I love to read an honest review. I like the look of them but agree with another commenter who mentioned too much packaging.